Did you spot the Star Wars: Rogue One cameo in the new Han Solo movie trailer? Donald Glover’s Lando ‘tache wasn’t the only incredible thing to come out the new Han Solo movie trailer. As it turns out, there’s an extremely well-hidden Star Wars: Rogue One cameo in the background of a blink-and-you’ll-miss-it shot. As uncovered by the folks over at Screen Rant, fast-forwarding to 0:58 in the latest trailer lets you clap eyes on the Easter egg. Does K-2SO show up? Or maybe Mads Mikkelsen is just chilling with those cheekbones of his? Unfortunately, it’s a bit more of a deep cut than that. Just who is that? For this one, you’re going to need an encyclopaedic knowledge of Star Wars. Literally. 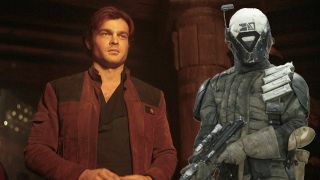 Having been given only a walk-on part in Rogue One appearing in a crowd in Jedha and getting his story massively fleshed out in Rogue One’s Ultimate Visual Guide, bounty hunter Tam Posla shows up out of the blue behind Han Solo in a gambling den. Sure, it’s not quite Cap’s shield showing up in Iron Man, but it’s a nice nod nonetheless. The big question is: what role (if any) will Tam Posla have to play in Solo? He’s sure too distinctive just to show up in a non-speaking role yet again. Could he be under the employ of Paul Bettany’s villainous gangster character or at odds with Han throughout the entire movie? That's one cameo you didn't spot. How about another 15 Star Wars cameos you never noticed?